Hello and welcome to Vegan Round-Up! I'm not sure yet how often I'm going to do this, but the idea is to profile three places offering vegan food in Berlin. First round: Mister Subs, Black Sheep and Kontor Eismanufaktur. It's a Sunday, the sun is out in full force... but I desperately need to get some writing done. I had originally planned to go to Pêle Mêle, but it's brunch day and so it's completely full. I need to think on my feet; where else has good WiFi? But, I reason, I can't possibly be expected to be productive on an empty stomach. And cafés with good WiFi and good vegan snacks aren't easy to come by - not even in Berlin. I make my way back towards Sonnenallee, when a sign catches my eye: VEGAN PIZZA. Of course I'm going to go and investigate. I enquire after the vegan pizza. The cheerful man says all of them are vegan if you ask them to be. I'm a bit sceptical about how they account for the ham, and I don't think I can stomach a full pizza, so I order a funghi - the smallest, cheapest and veggie-anyway one. The crust is pretty good. 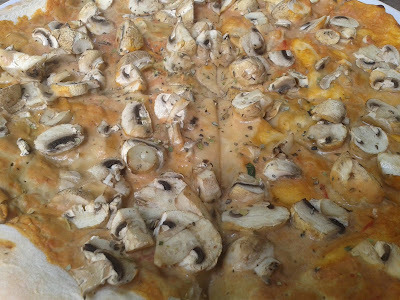 The pizza itself consists of mushrooms, of course, with a nondescript vegan sauce - similar to carbonara? I'm not sure it really works. So: far from the best, but at €6 for a diametrical 27cm of pizza, I can't complain. Pizza-delivery places offering vegan options are on the rise in Berlin, though, which is fantastic news for my drunk self. Can we all admit that Alt-Treptow is just a sneaky way to live somewhere cool? It's only a couple of bus stops away from Disneyland Schlesisches Tor and a hop over the canal from Neukölln. Black Sheep followed me on Instagram a while back so, in kind, I've been following their adventures with great interest. They seemed really cute so I had always meant to stop by, but it's so out of the way from anywhere I'm usually hanging around. This is a café run by two lovely ladies from Australia and it's 100% vegan. There are cookies, there are cakes, there are healthy things in jars, there are bagels, there is a variety of drinks (not least coffee; if there's one thing I have learnt about Aussies since living in Berlin, it's that they love coffee). So, I order the Korean bagel. It is absolutely delicious. Sesame bagel with tempeh, homemade kimchi, avocado and vegan cheese. Yes yes yes. 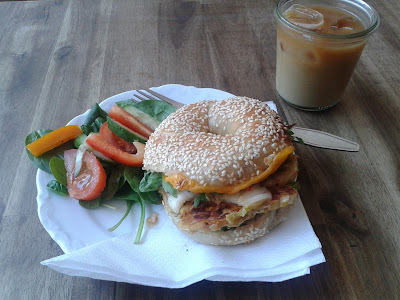 I must emphasise that this was a bit of a treat; the bagel (€5.50) and cold brew (€3.50) add up when you are out of work and sticking to a tight budget. However, it really was filling - plus, the inexcusable heat that day made the cold brew a very, very good decision. More than worth the trip to Alt-Treptow's leafy streets! I expect I will be coming back here to cool down again very soon. Not news, but I need to tell you all about how glorious the chocolate-orange ice cream here was the other day (pictured). The only thing that would have made it even better would be going the whole hog and made it into a Jaffa Cake ice cream. 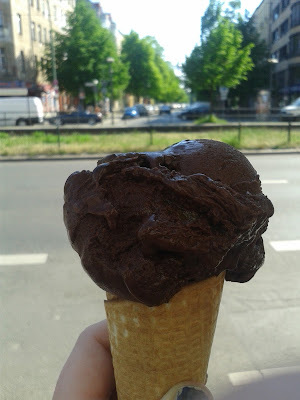 Just in case you weren't aware: Kontor is Berlin's first 100% vegan ice cream parlour. They do amazing waffles, too. Also, since I last mentioned it, Kontor now has a tiny branch in Mitte, just off Koppenplatz!